Dental crowns will allow your tooth to function normally again without worrying about the tooth cracking. A dental crown is a type of dental restoration which completely caps or encircles a tooth or dental implant. Dental crowns are often needed when a large cavity threatens the ongoing health of a tooth. They are typically bonded to the tooth and can be made from many materials. Porcelain crowns are often used to improve the strength or appearance of teeth. For more photos visit our Porcelain Crowns and Bridges smile gallery. 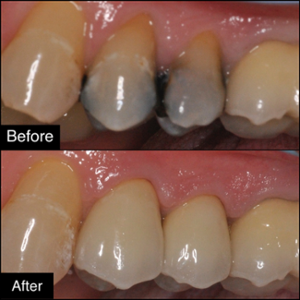 Conventionally, dental bridges are made using the indirect method of restoration. However, dental bridges can be fabricated directly in the mouth using such materials as composite resin. 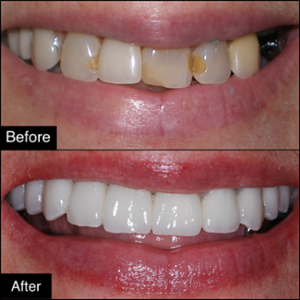 For more photos visit our Porcelain Crowns and Dental Bridges smile gallery.